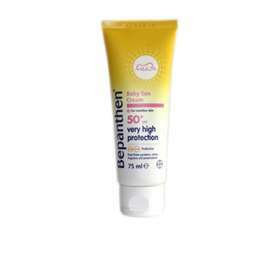 Bepanthen Baby Sun Cream SPF 50 is formulated for the delicate skin of babies. Its gentle ingredients include no colours, fragrances or preservatives. Very high UVA and UVB protection. Free from parabens, colour, fragrance and preservatives. Suitable for babies from 6 months. Apply generously 15-30 minutes before sun exposure and then shortly after heading outdoors. Re-apply every 1-2 hours to maintain protection and especially after perspiring, swimming or towelling. Babies and young children should be kept out of direct sunlight and should wear protective clothing and a hat. Bepanthen Baby Sun Cream SPF 50 should be used to avoid sun exposure, especially between 11am and 3pm. Over-exposure to the sun is a serious health risk but if used as advised, Bepanthen Sun Cream will significantly increase protection against UVA and UVB rays. Aqua, Octocrylene, Alcohol Denat., Glycerin, C12-15 Alkyl Benzoate, Butyl Methoxydibenzoylmethane, Ethylhexyl Salicylate, Titanium Dioxide, Dicaprylyl Carbonate, Bis-Ethylhexyloxyphenol Methoxyphenyl Triazine, Tocopheryl Acetate, Triacontanyl PVP, Diethylhexyl Butamido Triazone, Silica, Panthenol, VP/Hexadecene Copolymer, Acrylates/C10-30 Alkyl Acrylate Crosspolymer, Carbomer, Ethyhexylglycerin, Sodium Hydroxide, 1,2-Hexanediol, Caprylyl Glycol, Dimethicone, Cetyl Dimethicone, Disodium EDTA, Xanthan Gum, Aloe Barbadensis Leaf Juice Powder, Citric Acid, Tocopherol.